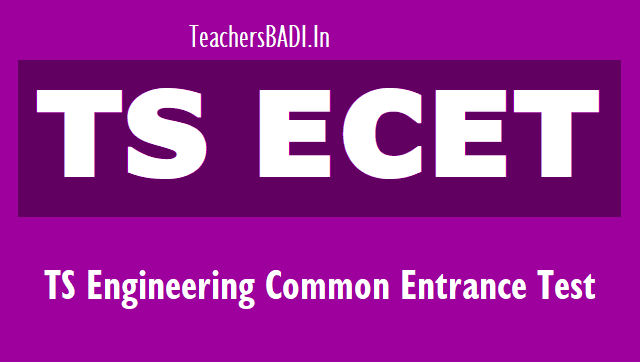 A Common Entrance Test designated in full as Engineering Common Entrance Test for Diploma Holders and for B.Sc. (Mathematics) Degree Holders and in short as ECET (FDH & B.Sc. (Mathematics)) 2019 will be conducted by JNT University, Hyderabad on behalf of the Telangana State Council of Higher Education for the academic year 2019-2020 for B.Sc. (Mathematics) degree holders. Candidates should satisfy the following requirements to be eligible for appearing at the ECET [FDH & B.Sc. (Mathematics)]-2019. (iii) They should have obtained a Diploma in Engineering/Technology/ Pharmacy from the State Board of Technical Education of Telangana State/Andhra Pradesh or any other Diploma recognized by the Government of Telangana/ Andhra Pradesh as equivalent there to for admission into the relevant B.E./ B.Tech./ B.Pharm. Courses corresponding to the Diplomas as given in the following Annexure IV.. Candidates should have appeared and qualified at the ECET-2019. Mere appearance at the Entrance Test does not automatically entitle a candidate to be considered for entry into any course unless the candidate satisfies the requirement of eligibility and other criteria laid down in the rules of admission. Admission to 85% of the seats in each course shall be reserved for the local candidates and the remaining 15% of the seats shall be un-reserved seats as specified in the Telangana and Andhra Pradesh Educational Institutions (Regulations and Admissions) Order, 1974 as subsequently amended. Qualifying marks in ECET [FDH & B.Sc. (Mathematics)-2019. The qualifying percentage marks for obtaining a rank in ECET [FDH & B.Sc. (Mathematics)]-2019 is 25% of the aggregate marks in the four subjects (three subjects for B.Sc. Mathematics) i.e., 50 marks out of a total of 200. However, in the case of SC/ST candidates, there shall be no minimum qualifying marks for ranking the candidates. The rank obtained with the benefit of relaxation of the minimum qualifying marks at the ECET [FDH & B.Sc. (Mathematics)]-2019 by any candidate claiming to belong to SC/ST category will be cancelled in case the claim is found to be invalid at the time of admission. (i) The student will be ranked (Integrated Merit Rank) based on the marks obtained by him/her in the ECET [FDH & B.Sc. (Mathematics)]-2019 Examination. (ii) Every care will be taken to avoid errors in valuation, checking, scrutiny, tabulation and ranking. Hence request for re-totalling, revaluation or personal identification of scripts will in no case be entertained. Candidates will be ranked in the order of merit in ECET [FDH & B.Sc. (Mathematics)]- 2019 separately in each branch of Engineering Course. (iii) As per Government Order all Diploma holders in any branch of Engineering/Technology, who qualify in ECET [FDH & B.Sc. (Mathematics)]-2019 are eligible for admission into B.Tech. Information Technology and Computer Science and Engineering branches. The Integrated Merit Rank is for admission into B.Tech. Information Technology Course. The Integrated Merit Rank is based on the total marks obtained in ECET [FDH & B.Sc. (Mathematics)]-2019 by candidates with Diploma in any branch of Engineering/Technology. Candidates will be ranked on the basis of merit in ECET [FDH & B.Sc.(Mathematics)]-2019. In case of tie the percentage of marks secured in the qualifying examination will be taken into consideration. On further tie, age will be taken into consideration; the older candidate will be given priority. (v) The rank cards will be posted to the candidates address as given in the application. Eligible candidates who wish to apply for ECET-2019 may submit their applications through ONLINE mode ONLY from ............-2019 to .............-2019 (without late fee). Detailed information regarding Syllabi, List of courses, Procedure for Online Application with without late fee etc., is given in the detailed notification and "Instruction Booklet" displayed in the website http://ecet.tsche.ac.in/. This is only a Notification for entrance test. Candidate has to fulfill the eligibility criteria laid down in the relevant G.Os at the time of admission. The Registration fee may be paid at TS Online/ AP Online/ Mee Seva /e-Seva centers in Telangana State or A.P/ through Payment Gateway (Credit card/Debit card).